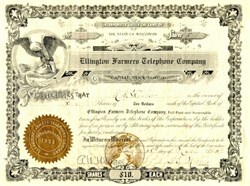 Beautifully engraved Stock certificate from the Ellington Farmers Telephone Companyof Wisconsin dated 1910. This uncancelled document has an ornate border around it with a nicet vignette of a woman figure and an eagle. The historic old telephone document is hand signed by the officers of the company and has some signs of wear.